Parents struggling to find a “Children’s Dentist Near Me” should contact Great Beginnings Pediatric Dentistry. GBPD specializes in making the dentist’s office experience as comfortable as possible for all children, creating a welcoming and comfortable environment. The staff encourages the curiosity inherent in children to enforce a positive experience. They answer all your child’s questions by explaining everything in child-friendly terms they can understand. Great Beginnings Pediatric Dentistry teaches children to love their visit to the dentist. 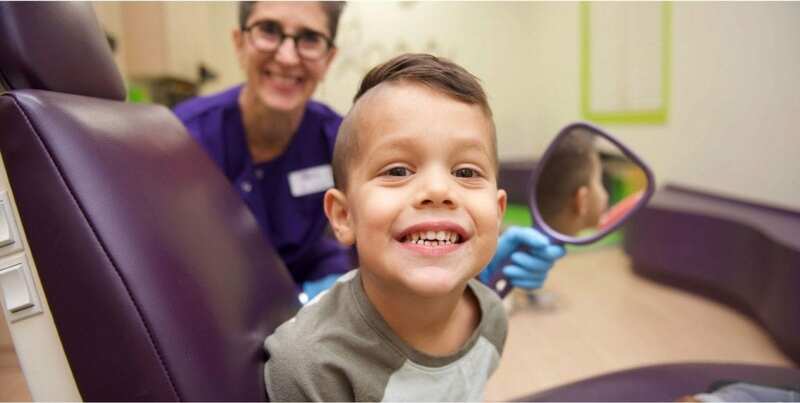 The GBPD staff excels at creating a positive dentist’s office environment for children; furthermore, they also are constantly look for ways to improve the dental hygiene technologies at their disposal. The application of advanced technologies is crucial for improving the dental hygiene experience. When the technology receives an upgrade, so does the efficiency and gentleness of the treatment. Traditional x-ray machines produce radiation that is safe for children; however, most parents are concerned about x-ray radiation exposure. GBPD has taken time to address these concerns. They now offer digital radiography, produces 70% less radiation than traditional x-ray machinery. Digital radiography also means faster imaging, which will shorten your stay at the dentist’s office. Digital radiography also produces higher quality imagery. Traditional x-ray machinery only uses 16 to 25 shades of gray to create the contrast, lowering the image’s sharpness. However, with digital radiography, 256 different shades of gray create a much clearer image of your child’s teeth. The sharper images allow for the dentists of GBPD to make the most accurate diagnosis possible. When people hear “laser technology,” they tend to think it sounds like science-fiction; however, laser technology has become a useful tool in the world of dental technology. Pediatric dentistry is only one of the medical areas that applies laser technology. The dentists of Great Beginnings Pediatric Dentistry, Dr. Adelman and Dr. Rosen, are both certified in laser dentistry. The GBPD team began offering this technology in 2015, and it has improved the dentist’s office experience for many children. Cavities can still find a way to develop even with a healthy diet and consistent brushing habits. The large majority of children think receiving a filling causes immense discomfort, but the Solea laser GBPD uses makes the experience much less uncomfortable. Dr. Laura Adelman (DMD) has many years of experience working in pediatric dentistry, having spent an extra two years training after her time in dental school. She has dedicated herself to the dental health of children from infancy into adulthood. Dr. Adelman studied at the University of Pennsylvania School of Dental Medicine, and she also received her postdoctoral training at Rainbow Babies and Children’s Hospitals of Cleveland and Case Western Reserve’s School of Dentistry. Dr. Rachel Rosen (DDS) is also a highly experienced dentist. She was born and raised in Orange Village, Ohio and received her undergraduate degree in Biology from Ohio State University. Dr. Rosen then finished her Doctorate of Dental Surgery and also went through an extra two years of training. Then, at the Boston University School of Dental Medicine, Dr. Rosen received her Certificate of Advanced Graduate Studies with a pediatric dental residency. In addition to her high-quality educations, she also has extensive experience in caring for infants, children, and adolescents with special healthcare needs. Dr. Laura Adelman and Dr. Rachel Rosen are qualified to give children a pleasant dentist’s office experience, and they are also passionate about the work they do. If you have been searching for a “Children’s Dentist Near Me,” Dr. Adelman and Dr. Rosen of GBPD are exactly who you and your children are looking for.